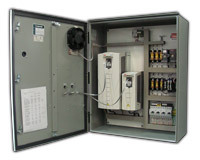 HUNTAIR enclosures are manufactured as a custom design with the customers requirements integrated. Every HUNTAIR enclosure complies with U.L. and Nema Directives. HUNTAIR has only two standard enclosure designs to satisfy all different enclosure types. Components are added or subtracted to comply with desired standard. Enclosures be powder coated to your specifications.